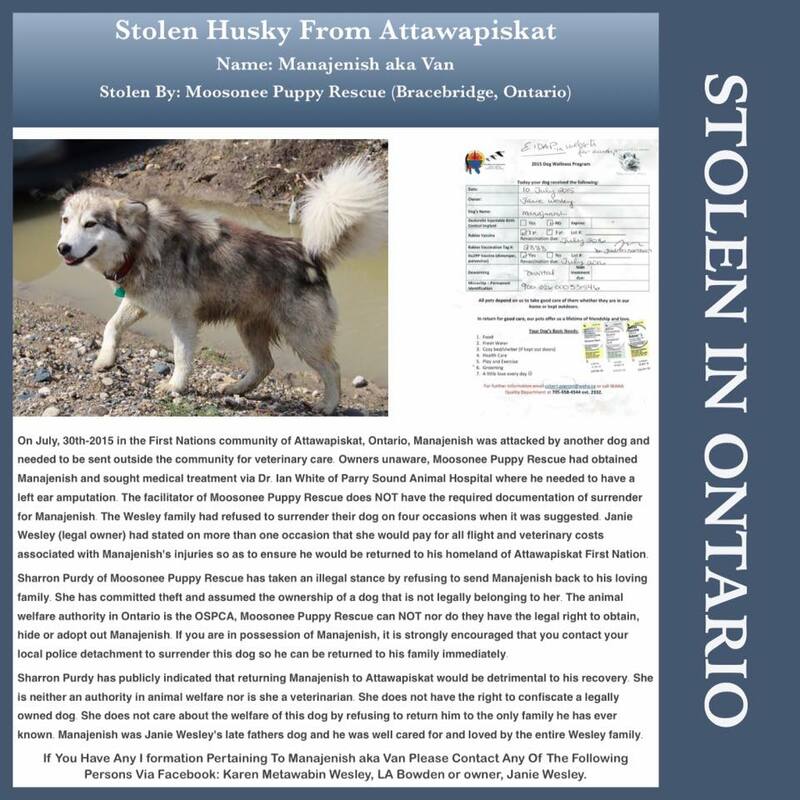 Toronto Dogs Directory: The Case Of Manajanish : How Did One Dog From Northern Ontario Spark So Much Controversy? The Case Of Manajanish : How Did One Dog From Northern Ontario Spark So Much Controversy? 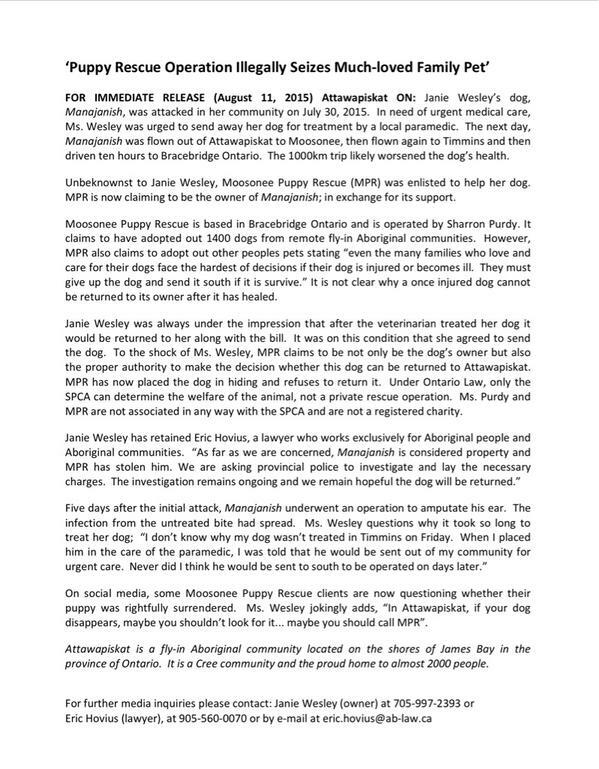 In late July in Attawapiskat First Nation, Janie Wesley's dog Manajanish was attacked by another dog. Upon advice from a local paramedic, Wesley agreed it would be best for Manajanish to be flown south to receive adequate veterinary care. 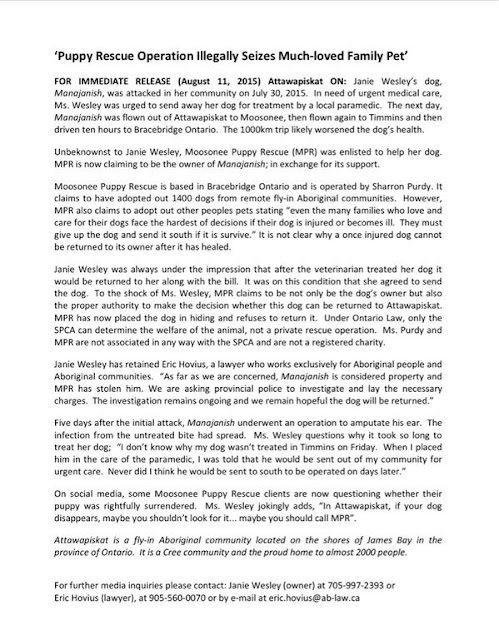 Moosonee Puppy Rescue (MPR), an organization started by Sharron Purdy, claimed responsibility for Manajanish. A brief history of stray dogs in Attawapiskat and why Purdy started MPR can be found in an article in the Toronto Star from 2012. Before I go on I should state that I have been quite supportive of MPR, from the organization's spay/neuter campaigns in Northern Ontario to the many adoptions of dogs into new loving families (many of these dogs have been featured in my photo contests over the years). Indeed the organization has, and continues to do tremendous work in this endeavor. "I admit the question many of you are asking is a reasonable one and if it was coming from reasonable people I would have more faith in the possibility that my answer would end this campaign that long ago stopped being about a dog’s welfare and became about hating me. It has been well established that nothing I say is good enough or accepted as being the simple truth from a person who has no reason to lie. The demands to return the dog don’t allow for the fact that he was only surrendered to us because he was severely injured and needed extensive veterinary care. Many are responding as if the dog was a mistaken stray or healthy dog the family put on an airplane by mistake and now want returned. His injuries have been totally overlooked on Facebook it seems. We have a public record of our work and who we are and it covers a twelve year period. Still, a handful of people, who don’t know the family, the dog or all the circumstances surrounding this issue have decided to pronounce verdicts left right and centre. No matter the contradictions in the stories against us or the changes in explanations of what was thought, felt or done, blind support is offered. People suddenly know the law better than the police and the courts and have all kinds of reasons not to trust them. Nothing of worth or credibility has been accepted. I will answer the question of the dog’s return once and for all. Those who simply pretend to care about him will not accept it but the few of you who actually do want what is best for him will understand. This dog had his ear amputated and he is no longer physically able to live up north where he will spend much of his time outside as is natural and be vulnerable, not only to other dogs, but to insects, dirt and the severe cold of northern winters. 40 degrees below zero is hard on anyone and anything but a dog with his ear drum completely exposed would be in constant pain. His hearing has been impaired so he is further disadvantaged by this as well. The families promise to keep him inside, while honourable, cannot be realistic. A dog cannot live his whole life indoors – it is not fair to the dog or the people in the home. He has to be let out for many reasons. There has never been a question that the dog belonged to the Wesley family and there is now no question that they gave him to MPR because that is what was best for the dog. I didn’t create the situation but I did respond to it when asked. It is all too easy to dismiss my attempts to be compassionate and caring with the family. There is nothing to be gained by my keeping this dog or paying his vet bills other that doing what is best for him. In addition to his permanent disability that will need ongoing and regular veterinary care he has a bladder condition that is preventing him from peeing and resulting in toxins backing up in his system. Since so many of you claim to know me so well you will be familiar with the number of times I have said “I will never let a dog down” and “I would never lie about a dog”. So my answer is, I will not let this dog down by returning him to a place where he can’t receive the veterinary care he requires, will be at risk of infection and be forced to endure pain for many months of the year due to extreme cold. The Wesley’s love can’t change those facts and no hate campaign against me or our rescue will change them either. I am sure the good and caring amongst you will be grateful the dog is getting the care and attention he needs and deserves while still feeling sorry for the family who had to do the right thing in giving him up. Love is not always enough and it certainly doesn’t make everything right. Many of us know this all too well because we too have had to make the most difficult decisions possible when we let one of our beloved animals go to spare them pain, confusion and suffering." 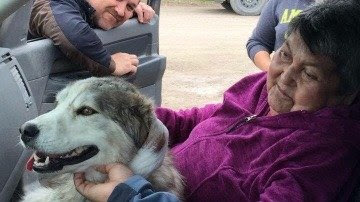 The case of Manajanish has grabbed national attention as it speaks to so many aspects of animal welfare in Canada, from poor living conditions of countless stray dogs in northern communities to pet "ownership" (I really hate that word). When it comes to Manajanish? I would love to see him returned to his family, provided no law agency has any record of the dog ever being abused. He is certainly not a stray dog, as he has a family who has loved him for years. MPR has done such great work in Attawapiskat First Nation in the past, and I understand they have sincere concern for Manajanish's ongoing health. That said, if I ever found myself in Janie Wesley's position? I would never stop fighting until my family was once again whole. Where do you stand on the case of Manajanish? Feel free to comment below or have your say on the Toronto Pet Daily Facebook page.